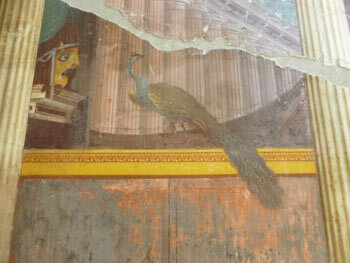 Like Pompeii and Herculaneum, Villa Oplontis was both destroyed and preserved by the eruption of Veusuvius in AD79. Buried until its gradual discovery over the last four centuries, this huge and lavish palace has been associated on slender evidence with Poppaea Sabina, the unfortunate wife said to have been kicked to death by the Emperor Nero. Her family are believed to have come from this area, and the grandeur of the villa suggests it belonged to someone either very rich or very well-connected. A wine amphora found here bore the inscription of the name "Poppaeae". Consequently the villa is sometimes called Villa Poppaea, and is also known as Villa A by archaeologists studying the ruins around the site of the Roman seaside village of Oplontis (and as Scavi di Oplonti in Italian). Lying under the modern Naples suburb Torre Annunziata, the full extent of the villa complex hasn't been discovered. But what there is to see is very impressive. The site is under-visited compared to its famous neighbours, and it is a fascinating and atmospheric place to get the feel of real Roman luxury. The villa is included in the UNESCO heritage listing "Archaeological Areas of Pompeii, Herculaneum, and Torre Annunziata". 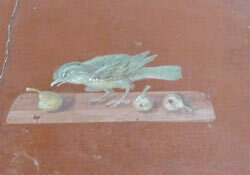 The villa makes a good complement to visiting Pompeii and Herculaneum. The impressive state of preservation and the villa's lavishness help to give context to the urban dwellings in the two larger sites, and its colourful frescoes enable the visitor to visualise the details which have been lost elsewhere. The Roman elite favoured the Bay of Naples for holiday retreats. Just as today's wealthy Romans and Neapolitans head to the island of Capri, in ancient times this area was a refuge from the heat and bustle of Rome in summer and a place to relax and indulge in civilised leisure; the pursuit of otium. The Villa Oplontis was a palace built overlooking the sea (the coastline is now further away). Archaeologists deduce that the rambling building had been through several stages of development, and at the time of the eruption which buried it, the villa was undergoing restoration works, and was perhaps somewhat neglected. There had been a major earthquake in 62AD, and many smaller tremors in the build-up to the big eruption of 79AD, which may explain this. During its lifespan, though, the villa must have been one of the grandest dwellings in the area. Its wall paintings are some of the finest examples of Roman painting in existence. Its large gardens were decorated with statues as well as trees and plants. Approached by land or sea, the villa would have impressed visitors even before they entered the colourful and refined halls,strolled through its various colonnades, or glimpsed the huge garden swimming pool. The ruins are well-enough preserved that it's possible to gain some idea of how people might have lived here; relaxing under a portico, taking a dip in the huge pool. Rooms are numbered and descriptions in the guide-booklet help to explain the decoration and what is assumed about their uses. Among the villa's comforts was a bath-house, several peristyles (colonnaded courtyards and gardens), and a range of richly-painted reception rooms. The most extravagant of these feature detailed illusionistic scenes of architectural features: temples, statues, gateways. The villa layout also incorporates service areas: small rooms where slaves may have slept, and narrow corridors providing quick and discreet access between the public spaces. These narrower, humbler corridors are decorated with simple 'zebra-stripe' paintwork, used here and elsewhere for the quarters of slaves and staff - although here the 'cheap' décor does seem used on occasion for loftier public areas. Mostly, it's clear how much the villa was designed to impress, and how dazzling its grandest spaces must have been. Most visitors would have entered through an atrium (Room 1) with a central pool to catch water falling through an aperture in the ceiling in the centre, and walls covered with trompe l'oeil frescoes of columns, doorways and other grand architectural features. One of the most striking spaces is Room 18, described as a 'sitting room', which opened onto the portico in front of the swimming pool and its surrounding garden. At the far side of the room was a large window onto the principal garden of the villa. And on either side, a sequence of windows opened onto rooms richly-painted with garden scenes, and then beyond that into tiny 'garden' courtyards, again decorated with garden frescoes. Trees, greenery, flowers, birds and water must have been visible in every direction, both painted and real, with nature being brought into the interiors. Although there must have been slaves, attendants and family members around, it's hard not to imagine the building filled with the same kind of peace that greets the visitor today as they wander around the quiet site, accompanied by the twittering of birds and the wind in the grass and leaves. The work that has been done to recreate the original garden plantings adds greatly to the atmosphere, which is so different to the busier and barer ruins of Pompeii and Herculaneum. The freedom to wander around a grand Roman villa over mosaic floors, to stand alone in a room gazing at the vivid frescoes, or to duck along a narrow service corridor to avoid a noisy schoolgroup, is really special. Villa Oplontis is included in several combined tickets, so visitors should think ahead to work out the most cost-effective choice. A basic entrance ticket (?5.50 at the time of writing) also includes admission to archaeological sites at Stabia and Boscoreale. The villa's also included on a combined ticket with Herculaneum and Pompeii (the sites are administered together), and as one of the free sites with a Campania Arte Card. Rooms in the villa are numbered and a good pamphlet, available in English and included with your ticket, provides descriptions and explanations for each featured location. This is also available to download online, which I'd recommend doing in advance, in case they aren't available when you visit: Pompeii Sites: Oplontis guide. The archaeological site is a few minutes' walk from the Torre Annunziata station of the Circumvesuviana train which runs from Naples to Sorrento. From Napoli Garibaldi the journey takes 30 minutes, and from Sorrento 33 minutes. If you time your travel to catch one of the rarer trains with limited stops, you can knock ten minutes off the journey from Naples. Pompeii is only one stop from Torre Annunziata, and Ercolano Scavi (for Herculaneum) is 15 minutes away on the same railway line. Outside Torre Annunziata station walk left, then turn right and continue straight down this road, over a junction, and continue downhill. On the way you'll pass a souvenir shop and a tourist information office (which may not be open). There's a bar on the way and another at the station. Services at the site were very minimal when I visited; just a couple of very basic toilets. Note that this a depressed area, and you wouldn't want to linger. You can see the site quite thoroughly in an hour, and it can be combined with Herculaneum in a comfortable one-day itinerary. 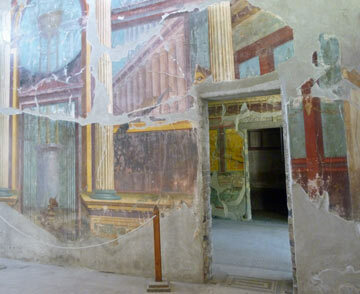 As Pompeii is so large and tiring to visit, I wouldn't try to fit in the villa on the same day. The most popular bases for visiting Oplontis and the other Pompeiian/Vesuvian sites are Naples - for a bustling city stay - and Sorrento - for holiday atmosphere. Some visitors, touring, choose to stay overnight in modern Pompei, which would be a practical option for combining the Roman sites over two days. Thanks to the transport connections, there's no need to stay in Torre Annunziata itself; though if you want to stay near the Villa Oplontis, local B&B Il Giardino di Tonia is a practical option. Pompeii and Herculaneum are the obvious Roman sites in the Vesuvius area. Naples and the Campi Flegrei area (Phlaegrean Fields) on the far side of the city offer many more ancient sites, including the drowned streets of Baia. If you're staying in Sorrento, take a walk or bus to visit the ruined Villa di Pollio Felice (Villa of Pollius Felix), built onto rocks above the sea. Like Villa Oplontis this would have been a fabulously luxurious dwelling, and combining in your imagination the surviving splendours of the Villa Oplontis with the seashore ruins' privileged location, you can really get a good sense of the luxury of the Roman villas and holiday homes of the elite which once dotted the coastline of Campania.